encore Deals! 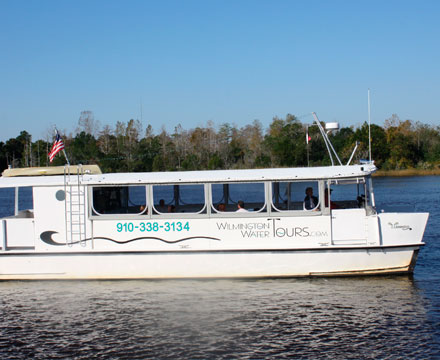 | 50% Off the History & Mystery Cruise from Wilmington Water Tours! 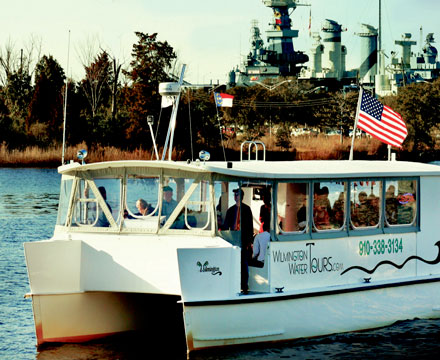 50% Off the History & Mystery Cruise from Wilmington Water Tours! Discover the History and Mystery of the Cape Fear River! Price is per person. Valid for the History and Mystery Cruise only. Reservations are required by calling 910-338-3134. No cash value. Come aboard and let Capt. Ed take you back in time. Time and water have hidden many clues to the history of the Cape Fear River and Wilmington. But they can be seen if you know where to look. The Wilmington is the first and finest state-of-the-art catamaran to serve greater Wilmington, North Carolina. A wake canceling design and stable platform make her comfortable, and as friendly to the environment as she is to our customers. Fully handicap accessible with a flexible layout allows us to provide sit-down dining for up to 35 guests or seating for 49. We offer scheduled, daily cruises from downtown Wilmington to Carolina Beach, Southport and Bald Head Island. Choose from a variety of excursions including sunset cruises, full-moon cruises, historic tours and eco-tours of the upper and lower Cape Fear River. Private charters are also available.